This walk: 2015-5-13. Oak catkins, oak apples, gorse blossom, violet, Yeo Farm, ladder stile, bluebells, step stile, Burrator House, Portland Lane, Sheepstor (St. Leonard's) Church, village cross, churchyard cross, war memorial, Rajahs of Sarawak, bull ring, St. Leonard's Holy Well. Previous walks in this area: 19th May 2010 & 21st April 2011. Oak tree male catkins, with young leaves expanding. Oak apples, or oak apple galls, also known as Devonshire galls! Also called marble galls (being the size of marbles) and possibly caused by the gall wasp, Biorhiza pallida. They might be oak marble galls that can occur on the common oaks, caused by another gall wasp, Andricu kollari, but this wasp needs the Turkey Oak to complete its life cycle. Spangle galls can also be found on the underside of oak leaves but they are smaller and at early stages brightly coloured; they are caused by another gall wasp, Neuroterus quercusbaccarum. Common Gorse aka European Gorse blossom: Western Gorse< is a low, ground hugging plant and flowers later. See here< for more details. Young Common, English or Pedunculate oak, Quercus robur leaves. The acorn is borne on a stalk called a "peduncle" whereas on the sessile oak, Quercus petrea, they are borne directly on the twig. In this oak, the leaves have small basal lobes where they join the stalk and these can be seen at the lower, left edge of the photograph. The path ahead before the turn right towards Yeo Farm. Centrally - young Hard fern (Blechnum spicant) vegetative fronds i.e. non-reproductive fronds. I will call this a Common Violet (Viola riviniana) because I didn't look closely and there are several alternatives and I'm not going to excite anyone with a (false) rarity ... other violets are: Sweet violet (V. odorata), Dog violet (V. canina), Early dog violet or Woodland violet (V. reichenbachiana), Bog violet (V. palustris), Hairy violet (V. hirta), Teesdale vioet (V. rupestris), Fen violet (V. stagnina aka V. persicifolia) and Pale heath violet aka Pale dog violet (V. lactea). Some can be ruled out due to their preferred habitats. Yeo Farm, with flowering wisteria ...... in 1992 this was a ruin and had been used as a cowshed for many years! Source:Mike Brown's Guide to Dartmoor CD-ROM (2001), Dartmoor Press, Plymouth. The lintel dates from 1610 AD and bears the initials IW, possibly for John Willcocks, with the "T" signifying his wife? The other symbol the formerly secret Christian Ichthys sign of the fish. Looking forward from the same location. A deep run-off area - Smallacombe. Looking down the sunken lane after joining it at the top. Greater Stitchwort (Stellaria holostea), with 5 cleft, rounded petals: Lesser Stitchwort (Stellaria graminea) has more slender, deeply divided petals. Another step stile on the other side of the hedge. Burrator House, first recorded in 1718, now much altered. Beara Tor (the origin of "Burrator"), meaning "the tor in the wood", is in its grounds. Sir James Brooke (1803-1868), the first White Rajah of Sarawak, the largest of Maya's thirteen states, lived here from 1859 to 1868. The house was sold to Lord Roborough (the Lopes family and Maristow Estate) in 1877 with 72 acres of land. It ha had various incarnations as a farmhouse and country hotel (Dartmoor Magazine, Issue 124, Autumn 2016). See further internet links below. An impressive tree passed along the route, the previous step stile can be seen in the corner of the field - towards the right edge of the photograph. Colly or Sheepstor Brook, looking towards Burrator. I remember similar gatherings around the village pump where people came to draw their water (St. Erth, Cwll) - we'm didn't hev no cross! Sheepstor Village Cross, erected by vicar Hugh Breton in 1911 to mark the coronation of King George V. Low relief crosses are carved on two sides of the shaft, which was removed from a field where it was serving as a cattle rubbing post near Burrator House. COUNTRY IN THE GREAT WAR 1914-1918. Another view of the cross, alongside an ancient stile. The sculpture above the porch door, symbolising life after death, with corn sprouting from the eye sockets of the skull and with an hour glass below to signify the inevitabilities of the passing of time. 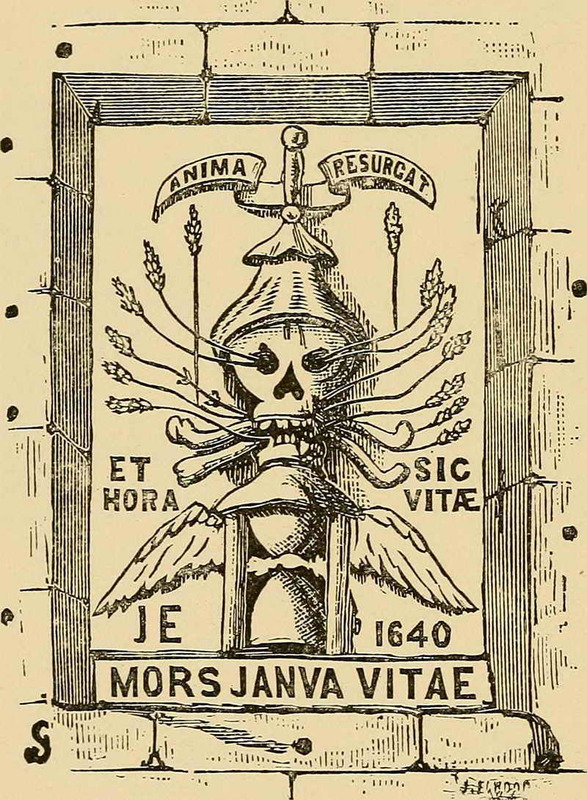 The inscription above the sculpture says "ANIMA REVERTET /Alternatively RESURGAT - The soul will return" while the insctption below says "MORS JANVA VITAE (Alternatively: MORS IANUA VITAE) - Death is the door to life" and at either side and halfway down "ET HORA : SIC VITAE - As the hour, so life passes". Also, hidden by the greenery above, is JE (left side) and 1640 (right side), JE could signify John Elford who once lived at Langstone Manor. The carving is thought to be the dial stone of a sundial, the pointer ("gnomon") and numerals of which are lost. Sources: (1) Legendary Dartmoor - Sheepstor church and (2) John Pegg (1986), Discover the Churches of Dartmoor, John Pegg Publishing, Fembury, Kent, page 55. KCB - Knight Commander of the Order of the Bath. Another view: Sarawak, in northern Borneo, was occupied during WW2 by the Japanese. After the war, the 3rd rajah ceded his life interest in Sarawak to the British Colonial Office in exchange for pensions for himself and his daughters. "There are several landscape features on the moor that are related to the packhorse, the most common of which are old trackways. Probably the most noted of these was the 'Jobber's Road' or Jobbers Cawse' which linked the wool producing area around Sheepstor with the mills around Buckfastleigh. It was along this route that the old traders would carry fleeces, yarn and cloth, these men were known as 'jobbers', hence the name of the track. Hemery, (1986, p.63) notes how at Sheepstor the medieval church house used to serve food etc to the travellers and even provided several fields for the jobbers to pen their packhorses, these fields were called - 'jobbers'. Source: Legendary Dartmoor - Dartmoor Crooks and Packhorses. Zoomed view into the bullring where the iron ring for attaching bulls is still to be seen in place - hanging from the top-left corner of the large stone in the ring of granite pillars. The panel beneath bears the text "These four Englishmen of differing character and temperament were at one in their fidelity to the policy enshrined in the first Rajah's words: "Sarawak belongs to the Malays, the Sea Dayaks, and Land Dayaks, the Kayans and other tribes: not to us. It is for them that we labour; not ourselves"
St. Leonard's Holy Well, seen after exiting the churchyard by the far gate i.e. in the east wall and turning right back towards the village cross. From the link: "It is sheltered by what looks like, and in fact is, a fragment of the church's old east window, removed during Victorian restorations." Also, a Dartmoor Trust archive photograph. Group photograph in Portland Lane. Hedge near the top of Portland Lane. Furze or Common gorse again, as a local reminder that "When the gorse blossom's missing, there'll be no more kissing!" Lots of it - near the top of Portland Lane. Looking over the edge of the road reveals what appears to be two sets of steps - the nearer set is topped by a culvert across under the road, presumably for drainage in times of heavy rain. The entrance to the culvert is located immediately left of the ball of "straw" nearest the camera - it was nigh on impossible to get a "face on" view without risking a tumble down the slope! 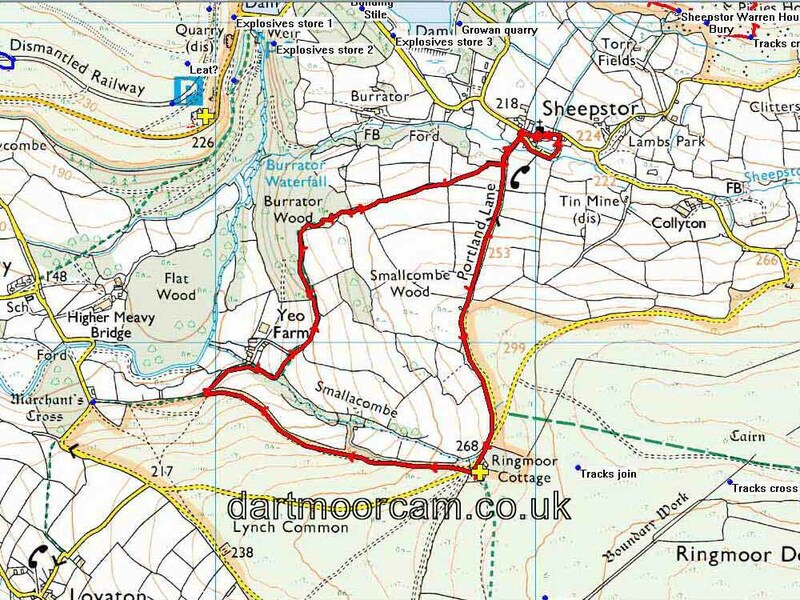 This walk was reached via Plympton, Cadover Bridge, turning right at Brisworthy and again before Sheepstor village, skirting the north edge of Ringmoor Down to Ringmoor Cottage and the small quarry car park, marked by the yellow cross on the map. Distance - 4.43 km / 2.75 miles.